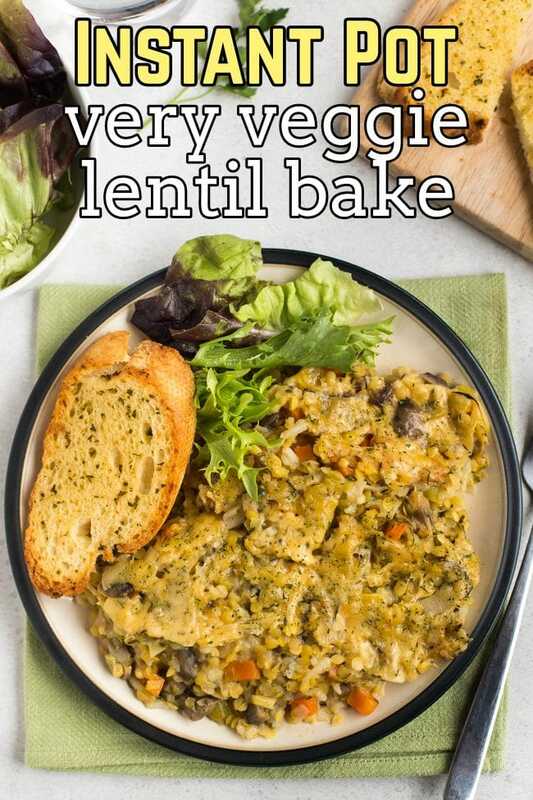 My hugely popular very veggie lentil bake recipe, adapted for cooking in the Instant Pot! My hugely popular very veggie lentil bake, adapted to be cooked in the Instant Pot! Even easier than the original. Food blogging is a funny thing – sometimes I’ll publish a recipe that I think is incredible, but you guys don’t really seem that blown away by it. Other times, I’ll publish something that you go unexpectedly crazy for! My very veggie lentil bake was definitely one of those recipes. It’s been viewed over 400,000 times, and literally every day I get an email, a message or a comment from someone telling me how much they enjoyed it – it makes me so, so happy! I knew it was a yummy recipe, but I didn’t know lentils could get people so excited. Anyway, a few weeks ago I gave in and bought myself an Instant Pot – and I decided my very veggie lentil bake should be the first thing I use it for. A few little tweaks, and the recipe is good to go! The Instant Pot has been a must-have gadget for the past couple of years, but just in case you’ve missed all the hype, I’ll give you a quick run down. It’s basically an automatic electric pressure cooker. You add your ingredients, program it to cook for a set amount of time, and then just leave it to do its thing. It generally takes 10 minutes or so to reach pressure, but once that’s happened, it cooks things super quickly – almost everything I’ve made in it has cooked in 10-20 minutes, even things that I would usually bake or simmer on the hob for a full hour. So it’s not quite ‘instant’… but it’s pretty quick. After your food is cooked, you just release the pressure, and it’s ready! I’m sure I’ll be sharing more Instant Pot recipes over the coming months – if you want to get yourself one so you can cook along with me, you can get them on Amazon (UK* / US*)! 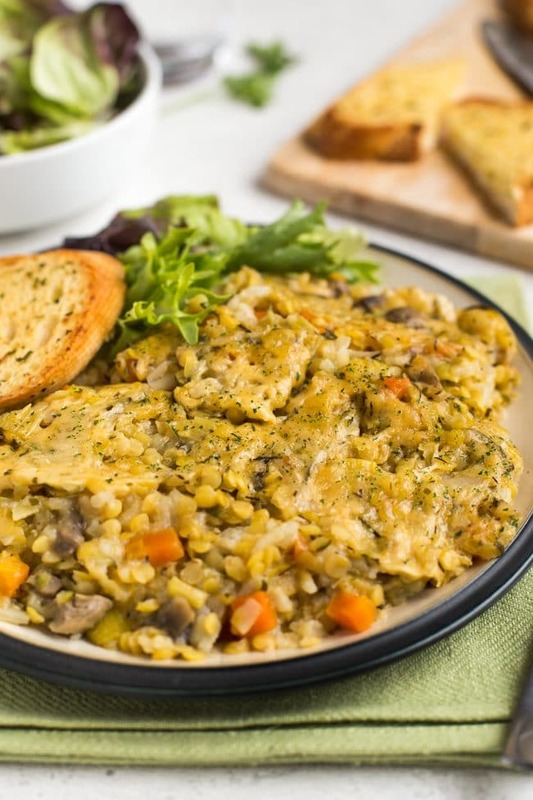 My very veggie lentil bake is one of my favourite dinners – it’s got a cheesy mixture of lentils, rice, and tons of veggies – all my favourites in one satisfying meal. The original recipe requires the lentils and rice to be cooked up together in a pan, and you also need to fry off the veggies separately. Then you mix everything together, and transfer to a baking dish to stick in the oven. It’s an awesome recipe, but it does require a bit of effort – there are a few different steps to it. With this Instant Pot version, you don’t need to do any of that. 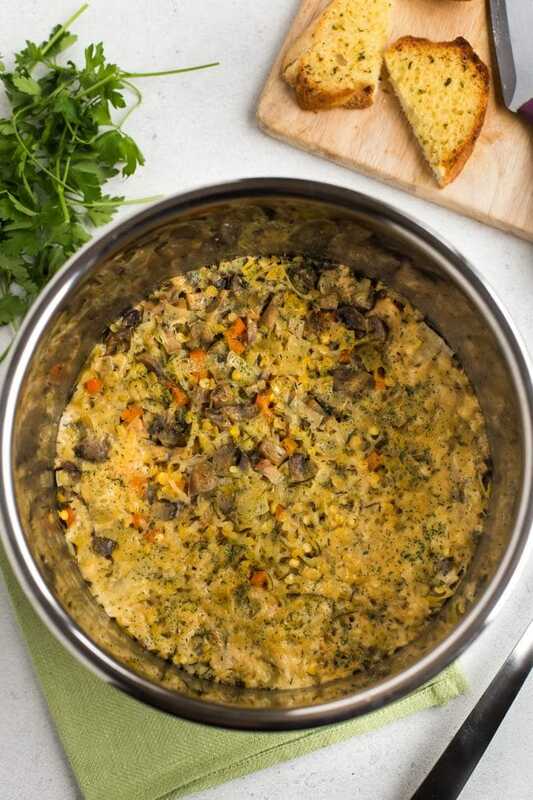 You obviously still need to chop a few veggies and grate some cheese, but that’s 100% of the prep – just add some veggie stock to help it all cook together, and you can go and relax while it cooks everything for you. The original recipe takes the best part of an hour to make, about half of which is hands-on prep time. This Instant Pot version takes just ten minutes to prepare, then 20 minutes to cook (plus an extra ten minutes or so for the Instant Pot to come to pressure). It may not seem like a huge time saving, but in terms of hands-on time, it’s much quicker to use the Instant Pot. My favourite thing about having an Instant Pot is that it encourages me to make healthy dinners from scratch more often. Usually, if I only have the energy to spend 10 minutes cooking dinner (i.e. almost every day of the week), I’ll resort to opening packets of processed food, and will just throw something in the oven. 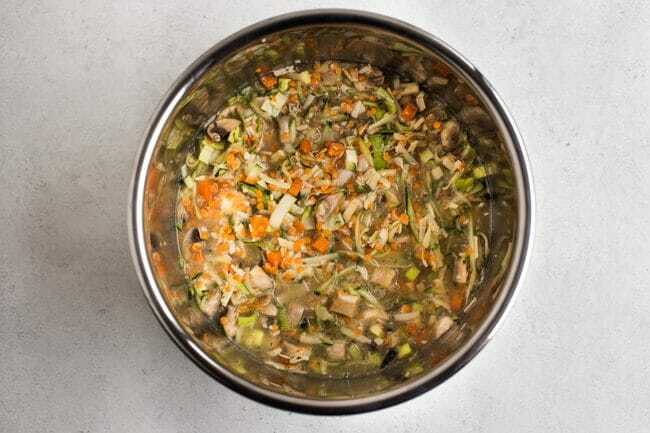 But with the Instant Pot, you can spend just a few minutes chopping vegetables, and in no time you’ll have a freshly cooked, healthy meal – no need to stand over the stove while it cooks. Are there any disadvantages to using the Instant Pot? The only disadvantage to this Instant Pot version of my lentil bake is that the cheesy topping doesn’t crisp up. It does all melt down and gives a nice cheesy layer, but it’s not a crispy one. 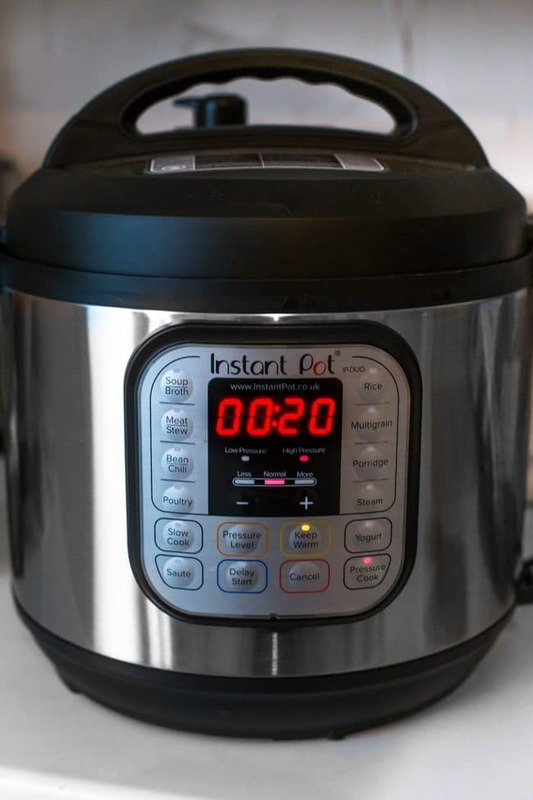 In my opinion, this minor disadvantage is well worth the time and effort you save by using the Instant Pot – I’ll definitely be making this version from now on! Crispy cheese is worth a lot… but it’s not worth an extra half an hour in the kitchen. 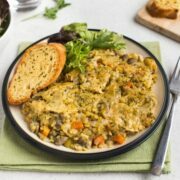 What veggies can I use in my very veggie lentil bake? I can never follow a recipe to the letter, even when it’s my own, so when I adapted my lentil bake for the Instant Pot, I did make a few minor changes to the original recipe. I added some diced carrot, for example, as I knew a hard vegetable like carrot would hold up well to being pressure cooked. I also grated the courgette (zucchini) instead of dicing it, so it melts right into the lentils as it cooks, keeping everything nice and moist. Feel free to switch up the veggies if you like, but remember that not all vegetables are going to be tasty when they’re pressure cooked – I imagine broccoli, for example, would turn to mush, so you might want to avoid that one! 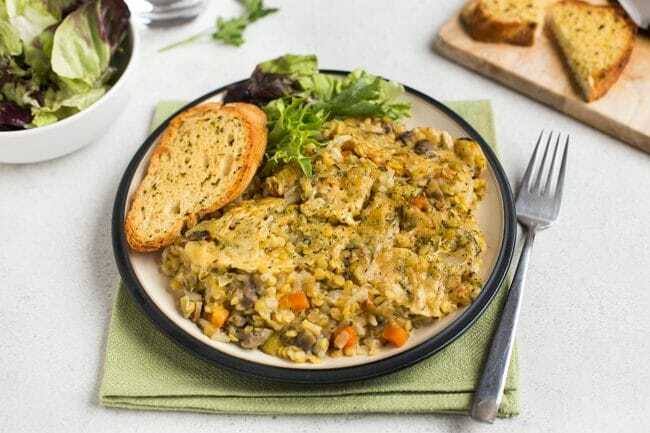 How should I serve my lentil bake? 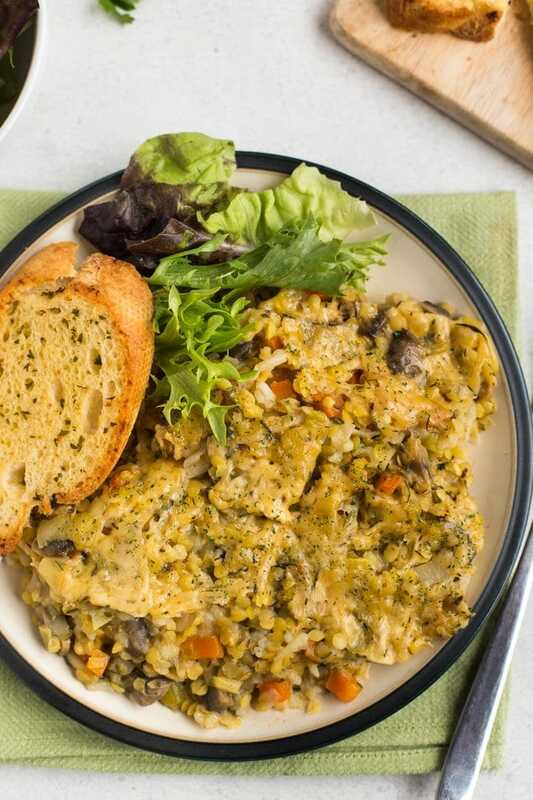 I love to serve my very veggie lentil bake with garlic bread – the crunchy bread is amazing at scooping up the soft lentils, and who doesn’t love a bit of extra garlic in their life? There are already plenty of veggies in the bake itself (it’s kind of in the name…), but you can serve a bit of salad on the side too if you’re feeling virtuous. Then just dig in! I promise you’ll love it. Add all of the ingredients to the bowl of the Instant Pot, just holding back about a third of the cheese. Mix thoroughly, and scrape down the sides so that everything is just submerged in the liquid. Sprinkle the remaining grated cheese on top. Place the bowl into the Instant Pot, and close the lid. Make sure the valve is set to 'sealing'. Set the Instant Pot to 'pressure cook' - high pressure, normal mode. Set the Instant Pot to cook for 20 minutes (it will also take an additional 10 minutes or so to come to pressure), and leave it to cook. When the Instant Pot has finished cooking, carefully perform a quick pressure release, and remove the lid. Serve warm. Please make sure you read the manual of your Instant Pot before attempting to cook with it, and follow all safety recommendations. 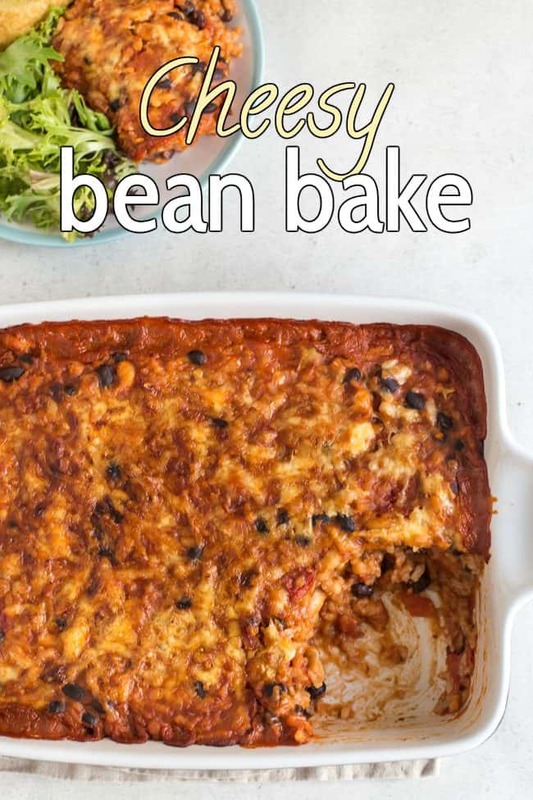 My cheesy bean bake is also super popular – give this one a try too! « Previous PostUK giveaway – win a Cuisinepro knife block worth £750! Don’t normally comment on blogs but had to stop to say this turned out amazing and I will definitely make again! Thank you so much! I love it when people take the time to comment on recipes they’ve enjoyed – it makes such a difference to us bloggers :) Glad you enjoyed it! It did let you comment! ;) I just have to approve comments from new people to avoid spam! Hi! I made this for the first time and the only thing I switched up was the seasoning, and I got the dreaded burn notice! Any tips to prevent this for next time? I love my instant pot, and use it most weeks, usually for cooking beans! 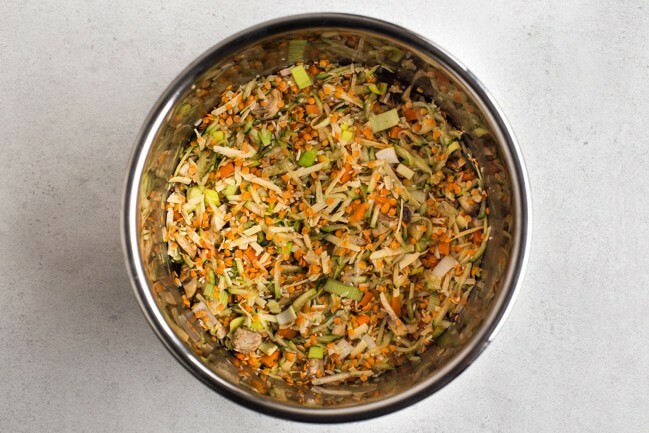 It’s also brilliant if you’re cooking a casserole of some kind, as you can pre-fry the vegetables in the same pot. I don’t like it so much as a slow cooker – I prefer my original one – but as a pressure cooker it is wonderful! I use it far more often than I used to use my old one – which now lives in our motor home for the occasional bean meal! As for your recipe, I think I’d do as another commentator suggests, and crisp the cheese topping under the grill for a few minutes, otherwise it might be a bit too moist. The veg lentil bake is so good, I’ve even got the mother in law making it every week! What recipes do you think are incredible that didn’t get as many clicks as you thought? I want to try them! I don’t have an Instant Pot but make a lot of use of my pressure cooker. With this recipe, I would leave the cheese out, then pop the cooked lentil bake into a dish, sprinkle the cheese on top then put it under the grill for a few minutes for the crispy topping. My man loves this bake but would not be happy without the crispy cheese topping so worth that extra minute to crisp the cheese! I have had an Instant Pot for over a year but still keep using my good old Crockpot. Yesterday I had to double the Crockpot Mac & Cheese I was taking to Thanksgiving and did it in both the Crock and Instant Pot. I still have it out so I will definitely give this a try. I will be looking for more recipes to use it with!